Endit Smokeless Inhalers Review: Do Endit Smokeless Inhalers Work? The Endit Smokeless Inhaler is a device that is shaped to look like a cigarette and contains cigarette flavorings, but it is not actually lit. Instead, the user draws on the Endit inhaler as they would a cigarette and receives a flavor similar to what they would taste if they were smoking an actual cigarette. The Endit inhaler mimics the feel in the user's fingers and mouth of a standard cigarette. The product contains no tobacco or nicotine, and it has no ingredients that help with the symptoms of nicotine withdrawal, so most experts recommend the use of Endit Smokeless Inhalers with another smoking cessation program that addresses the nicotine addiction. Endit inhalers are available in original and menthol flavors, and each inhaler will last for up to 30 hours of use. The product is useful for smokers who are trying to quit but have a strong psychological dependency on the act of smoking. Endit inhalers give them a device that can mimic the "draw" of smoking, but without delivering the nicotine, tobacco, and actual smoke from a cigarette. Some users note that Endit Smokeless Inhalers are also useful for smokers who must spend time in a non-smoking environment such as airplanes, restaurants, theaters, and non-smoking offices, as the inhalers help to control their desire to smoke a cigarette until they can move to a location where smoking is allowed. Mate tea, also known as Yerba mat�, is an herb native to South America that is known for its ability to increase concentration levels while still promoting relaxation. The herb is used in a variety of hot drinks for these properties. Endit Smokeless Inhalers are primarily available through online retailers such as Drugstore.com, eBay, and Cirrushealthcare.com. While product listings for Endit inhalers are still found at Walgreens and Amazon.com, the product itself is not available and may have been discontinued by these and other retailers. A typical price for Endit inhalers is Drugstore.com's price of $5.79 for a 2-pack of inhalers. Lower per-inhaler prices are available when larger quantities are purchased, as is the case with Cirrushealthcare.com's price of $24.99 for a package which contains 12 inhalers. Do Endit Smokeless Inhalers Work? Some smokers have had success in quitting smoking by using Endit in conjunction with another stop smoking aid, such as a nicotine patch or nicotine gum. 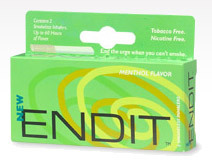 Because Endit does not contain any ingredients which address the physical craving for nicotine and the symptoms of nicotine withdrawal (which can include headaches, digestive upsets, and irritability), the chance of a smoker being able to stop smoking by using Endit Smokeless Inhalers alone is practically zero. Product testimonials for Endit inhalers are quite mixed. Some users praise the product for giving them something to do with their hands and mouth, and found that the taste was similar enough to a conventional cigarette that it gave them satisfaction. Other users found that the Endit inhalers were not at all helpful as a substitute for a cigarette. Some noted that it was difficult to inhale from the Endit inhaler, and they were not able to obtain much flavor. Still other customers stated that they did not like the taste of the Endit inhaler, and some even developed headaches from the use of the inhalers. A few testimonials contained praise for the Endit inhalers as a cigarette substitute when smokers were not able to light up, but these smokers were using the inhalers as a temporary substitute for smoking, not as a tool for actually attempting to stop smoking for good. Several users also mentioned that the Endit Smokeless Inhalers did not last nearly the 30 hours as the advertising had promised. Our overall conclusion on the Endit Smokeless Inhalers is that they can be helpful as a crutch when smoking is not allowed, and they may be beneficial when used in conjunction with another smoking cessation program that addresses the issue of nicotine withdrawal. However, this means that smokers attempting to quit smoking will be paying for two separate programs, which can be expensive. Endit Smokeless Inhalers are also somewhat difficult to obtain, as some retailers seem to have stopped offering them for sale.